in the mean time, I will still be selling my patterns on Patternspot.com. This is the Spiked Shortbread baby quilt. It is an intermediate level quilt because it uses a template for the 'spikes'. Marti Michel's template set R to be exact. The inspiration for this quilt can from an over all feeling that I wanted to use the materials, templates and rulers that I already own. Plus I wanted a quilt that looked modern, but I don't do well with wonky piecing. achieve the look of many of the modern quilts I see on other blogs. 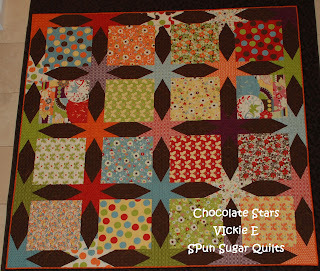 I had the Template set R from my Chocolate Drop quilt that can be found on Moda Bakeshop HERE. yep I used the same template for both. Spike Shortbread is pieced very quickly when you use the template. It's only 38" x 40" and I machine quilted it with my walking foot in about 4 hours. It's definitely a quilt that you can make in a weekend. 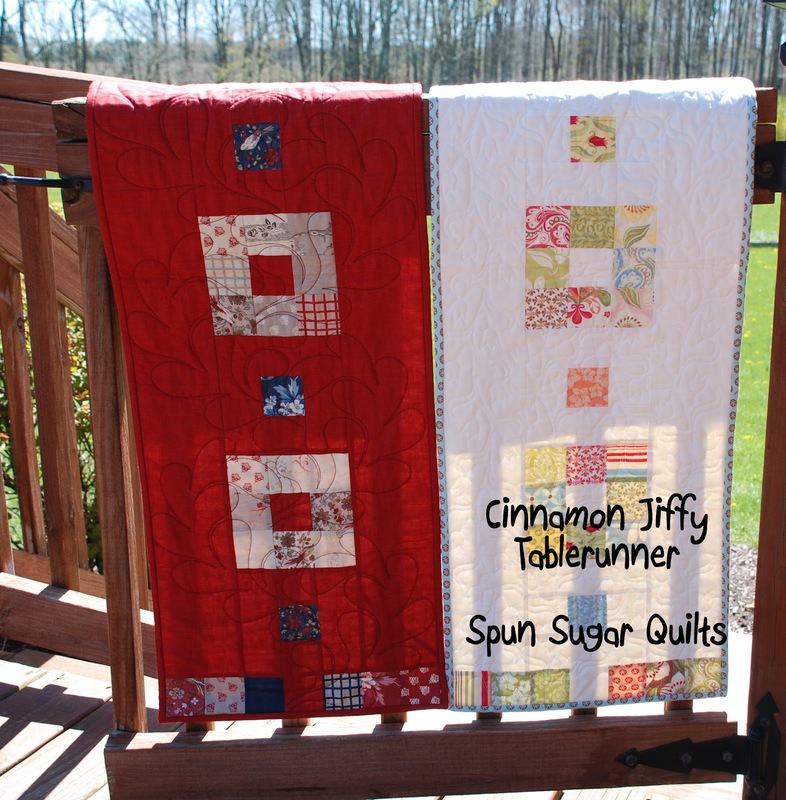 Cinnamon Jiffy is another pattern that I designed a couple of years ago for Quiltmaker. I decided to release the pdf version. 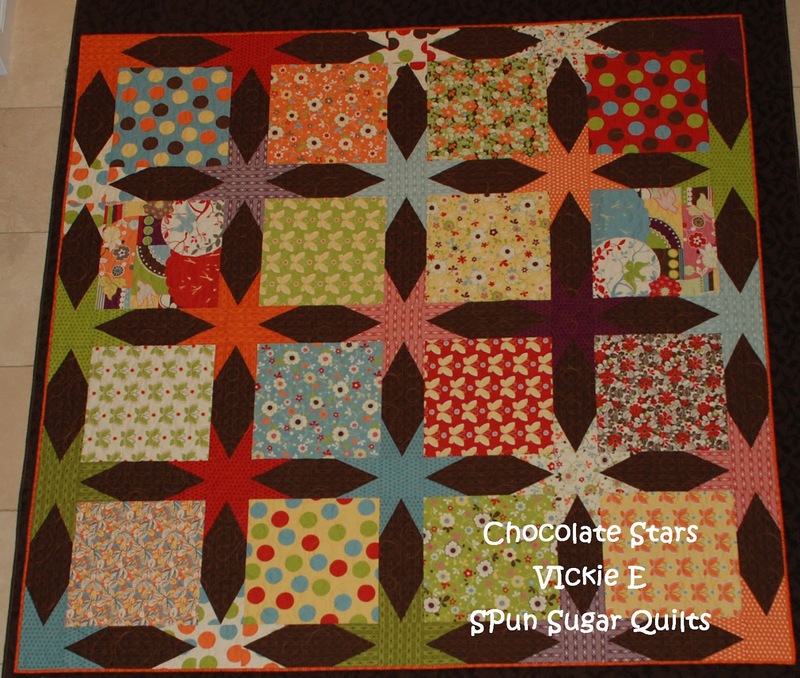 Once again this quilt can be created in a weekend especially if you a charm pack or 2 1/2" scrap squares. and I have used Origins by Basic Grey. I am giving away 2 sets of my PDF patterns. Leave me an email so that I can contact you and directly email the patterns!! I love Chocolate Stars and Cinnamon Jiffy! Both are very pretty. My favorite pattern of yours is the star tabletopper using Darlene Zimmerman's 30 degree triangle ruler. That was one of the first tutorials I ever made. Thanks for the giveaway! How pretty! 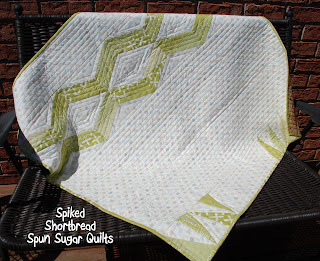 I love the look of both quilts - and thanks for the reminder of the bakes hop pattern too. Love the patterns. Thanks for a chance to win. Fitzptrklori at aol dot com. Congratulations with your new shop! Chocolate Drop quilt is sooo beautiful! Thanks for the give a way. I love your patterns. Great patterns. Also good to have some that are easy and fairly fast to complete. That's very cool Vickie. I like the Chocolate Drop quilt. Congrats on your new ventures. I don't know how you fit it all in. Love your blog. That Cinnamon Jiffy pattern is too cute! I need a new runner for the hunt board in my kitchen. This would be perfect! you have such a wonderful talent to create so many fun patterns! Great patterns Vicki! Congratulations on your creative expasion. Great patterns and thanks for the giveaway. I can see I need that set of Marti's templates. Thanks for creating great patterns! It is really nice to see a pattern use one of those many templates/rulers I already own. It seems lately that I know many people having babies - your Spiked Shortbread looks like the perfect gift. Quick, easy and so tasteful. Thanks for the opportunity to enter your giveaway. I love Chocolate Stars and Spike Shortbread! Great quilt patterns, I have a baby quilt to do and have been looking for something a little different and I love the red runner on your white dresser. Love finding this post today. Thanks for the give away chance. I love your designs. They are just so clean and crisp looking. love that table runner! gorgeous design! Love your patterns, of course! Thanks for the giveaway. Congratulations on your new site! I love your Spiked Shortbread! Congratulations on your new shop. Your patterns look great and I would love to win them! Thanks for the chance. Congrats on the pattern releases!! Yummy fabric choices, too! Congratulations on your patterns. They are great, and thanks for the giveaway. Thanks for the chance in your giveaway. New to your blog. Love your free projects. Love these designs!! Thanks for a great giveaway!! 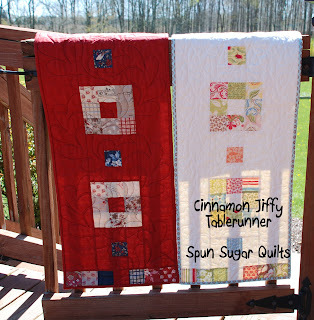 I REALLY love your quilts, but your table runners look awesome! raelynstoddard(at)hotmail(dot)com. How exciting to have started your own webshop!Love the Spike Shortbread. I hope you don't mind me saying, that I do think the website does not show the brightness and happy feeling that goes with you. But, it is all very clear!! Congratulations!! Hope your patterns fly off the shelves for you! I love Chocolate Stars. It's still on my "To Do" list. :) Thanks for the chance to win.